When major engine makers – for cars, trucks, farm equipment or motorcycles – announce an improved design that promises better fuel economy, lower emissions and higher power, Kelly Senecal may smile privately. After all, a good portion of the world’s major engine manufacturers are using engine simulation software developed by his firm, Convergent Science. The company, with deep roots in the UW-Madison department of mechanical engineering, makes advanced software that predicts and explains events inside the cylinder of an internal combustion engine – meaning virtually any engine powered by gasoline or diesel fuel. Software from Convergent and its competitors supplants the process of trial and error, which has ruled engine design since European inventors began chasing a replacement for the steam engine around 1860. In this simulation of the intake stroke of a four-valve gasoline engine, CONVERGE software shows fastest gas velocity in red and slowest in blue. Intake valves, left, are open and the piston is approaching the bottom of its stroke. The spark plug, top center, is inside a pre-chamber that helps raise efficiency. 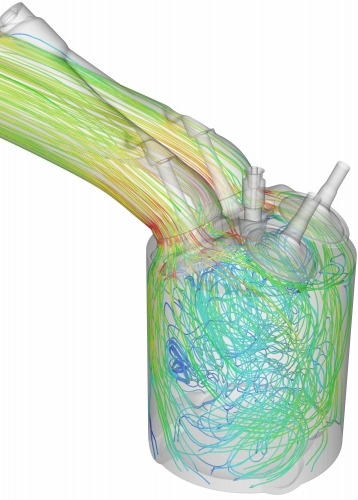 The analysis of the movement of gases and liquids is called computational fluid dynamics, or CFD. Senecal and his fellow co-founders learned their skill studying with professors of mechanical engineering Christopher Rutland and Rolf Reitz, who had long experience with software spawned by the U.S. atomic bomb project to analyze and predict gas flow. Running software that solves so many variables explains the large collection of computers in Convergent’s basement, where 3,500 processors are slaving at solving the complex equations at the heart of the software. Senecal and fellow co-founders Keith Richards, Eric Pomraning and Daniel Lee, are all owners and vice-presidents of Convergent Science (which has no president). Another co-founder, David Schmidt, is a professor at the University of Massachusetts. The company has 60 employees in Madison, and 20 others at offices in Detroit, Texas and Austria. 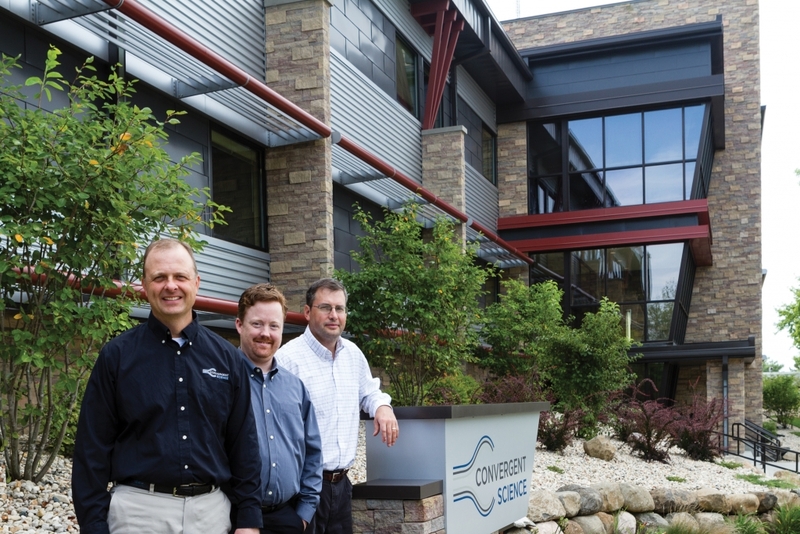 Convergent started selling engine-design software in 2008, when General Motors was on the verge of collapse. Even at that dark hour for the auto industry, the product was so good that CONVERGE shouldered its way inside the cylinder, the source of power in gasoline and diesel engines. Why, after more than a century of development, do internal combustion engines still need to improve? The ultimate driver, Senecal says, and the reason Convergent sees a bright future, is ever-tighter regulation on pollution and mileage. “Despite radical advances in the last couple of decades, there is still room for improvement,” he says.